Thrillseekers in the UAE can now experience the world’s longest zipline! The brand new facility based in Ras Al Khaimah – which sees people travel at speeds of up to 150kph at a height of 1,680 metres above sea level on top of Jebel Jais mountain – is now open to the public. The latest RAK adventure tourism product, entitled: ‘Jebel Jais Flight: The World’s Longest Zipline’ – has also won a Guinness World Record. The official certification was handed to HH Sheikh Saud Bin Saqr Al Qasimi, Member of Supreme Council and Ruler of Ras Al Khaimah, by Hoda Khachab, the official adjudicator from Guinness World Records. Indeed, HH Sheikh Ahmad bin Saud bin Saqr Al Qasimi was the first to trial the new adrenaline ride. “This is a great achievement for RAK’s international tourism ambitions,” said Haitham Mattar, CEO of Ras Al Khaimah Tourism Development Authority. And now for some more facts. 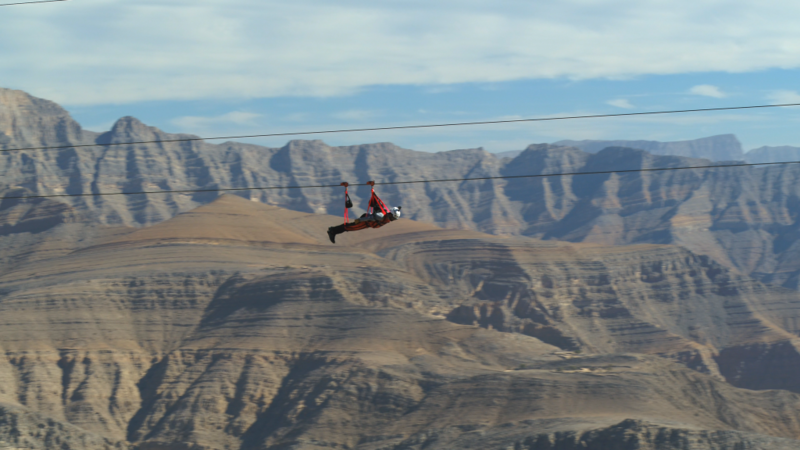 Measuring at 2.83 kilometres – the equivalent to over 28 football fields, and spanning the chasm of Jebel Jais, the zipline also weighs more than six tonnes and has been in the planning for over a year. Thrill-seekers will take to the skies and zip headfirst in a ‘superman’ style position. The experience will see participants fitted with a special suit and equipment, with the flight itself taking approximately two to three minutes. Once completed, guests finish on a suspended landing platform – unique in the world – where they are then transferred to a second line, measuring in at 1km, to complete their journey back to the ground. There are no age restrictions on ‘pilots’ but the requirements are a maximum weight of (150kg) and minimum weight of (45kg) for ‘fliers’ who must be at least 120cm tall. The zipline is priced at AED650 per rider. For more information and bookings, please visit www.jebeljais.ae. Besides being the national bird of UAE, the falcon is a totem for Emiratis and holds a special place in their hearts for ensuring their survival in the harsh living conditions of the desert for centuries. Even after years of technological advancements, the practice of falconry is preserved as a heritage sport and the success of the second edition of Sheikh Rashid Bin Humaid Falconry Championship was testament to the ever-growing popularity of this ancient sport. The championship kicked off on January 27 in the Al Helio region of Ajman and was held in cooperation with the Hamdan Bin Mohammed Heritage Center (HHC). The second edition of this tournament witnessed an increase of 100 participants since last year and there was significant growth in the Juniors’ category of the tournament. The contest was attended by HH Sheikh Humaid bin Rashid Al Nuaimi, Supreme Council Member and Ruler of Ajman, and HH Sheikh Rashid bin Humaid Al Nuaimi, Head of Ajman Municipality and Planning Department, and the patron of the Championship. He said: “This year’s championship has witnessed an increase of about 100 participants and two new events were added for juniors. During races, the falcons are timed over a distance of 400 metres and fly to the Daou, who can be heard calling it out in distinct voices while vigorously brandishing a bait made of pigeon wings to lure the bird in. “The falcon is a tough bird to train, and we really have to baby this bird a lot in order to familiarise it with us. We need to train it night and day, so it can identify our voices, react quickly, and fly to us as fast and low as possible to get through the sensor gates and clock in the time,” said Shabeer Ahmed, one of the Daous at the championship. 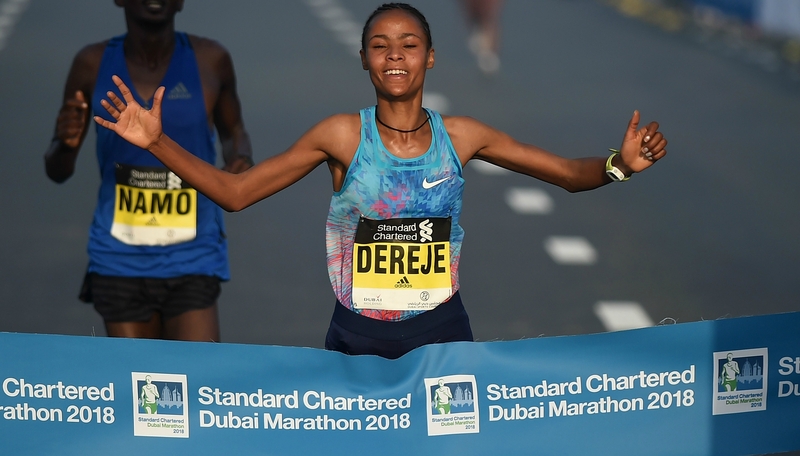 The Standard Chartered Dubai Marathon lived up to its billing as one of the world’s fastest events as course records were shattered in both the men’s and women’s elite races. Roza Dereje, a 22-year-old Ethiopian, cantered to victory in the women’s race – breaking away to win by 13 seconds in a new course record: 2:19:17. Below, is the top 250 finishers from the 2018 edition of the race.